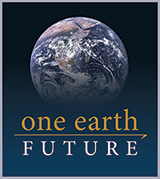 Why Work At One Earth Future? Work toward social change at an organization that operates with the efficiency and accountability of a business, allowing you to maximize impact. Collaborate with a team of talented professionals from around the world and with a diversity of expertise. Focus on program development and implementation, not fundraising. Be part of an action-oriented organization that applies intellectual rigor to some of the world's most complex issues. Affect global change from the foothills of the Rocky Mountains, a place recognized for its health, well-being, and quality of life. Great benefits, competitive pay, and tremendous job growth potential. "Institutionally, our job is to provide people a powerful challenge and to furnish them the resources necessary to meet it."